For your enjoyable and comfortable school life at this school that many international students are studying, our professional staff always supports you with guidance of residence (dormitories), searching jobs and so on. Bunka Fashion College was founded in 1923. Since then we have been leading the fashion education with numerous achievement which drew attention worldwide. 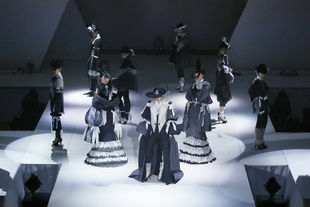 Many of our graduates have been playing active roles both in Japan and World stage; such as Kenzo Takada in Paris, Yohji Yamamoto, who revolutionized the fashion world, Chisato Tsumori, who is popular in mature girly style, Jun Takahashi of Undercover presented at the Paris collection, Yoshiyuki Miyamae, a designer of Issey Miyake, LVMH Prize finalist Hiromichi Ochiai from FASETASM, and many more. Bunka's specialized and practical curriculum adapts to the changes in a diversified industry, and it continues to cultivate fashion professionals who can easily adapt to the modern fashion industry. Bunka Fashion College's campus comprises of a 21 storey building that includes the latest facilities such a library, costume museum, and a resource center which provides a wealth of information on fashion. Bunka's campus contributes towards developing student's creative ability. There are 4 departments; Fashion Creation Department, Fashion Technology Department, Fashion Marketing and Distribution Department, Fashion Accessories and Textile Department. Each courses are customized accordingly to the Industrial and career trend. Students will also learn practically on the sensitivity, expression, technique of Fashion. ・With psychosomatic health, excellent academic performance, ambitious. ・Currently studying in Bunka Fashion College and expected to promote following year of study. ・Qualified for the next year's enrollment or have plan to pursue higher education. ※Depending on the judgement by Foundation. ・Students with "Student Visa"and pass the entrance exam on the 1st and 2nd semester, the application guide will be sent by Student Affairs Department. Applicants shall then apply accordingly. ・Enthutiastic on International relationship/friendship and willing to contribute. 1)Japanese Writing Test + Essay (400 words) 70 mins, Listening 20 mins.